Expert coders with experience at ambulatory surgery centers analyze the nuances that make coding at these institutions unique. Few in the healthcare field would argue that coding is uniquely specialized. One particular specialization that could be tagged as a subspecialty of the profession is ambulatory surgery center (ASC) coder. Because it’s considered a niche within the coding profession, finding coders with the base knowledge to survive in such a setting is not always easy. “There are not many of us out there,” says Stephanie Ellis, RN, CPC, owner of Ellis Medical Consulting, who points out that a clear understanding of how CPT codes work alongside modifiers in ASCs is crucial to solid reimbursement practices. Essentially outpatient surgery centers that perform procedures that typically do not require hospitalization, ASCs require coding practices that are different than their hospital and physician office counterparts. Bobbi Hyatt, RHIT, CCS, CCDS, CHPS, senior auditor and manager of HIM services with Healthcare Cost Solutions and an ICD-10 trainer, suggests that the nuances of an ASC can make coding much more of a challenge. Since many ASC coding professionals also do not have a network of other professionals in their respective facilities to collaborate with on issues, it is important to draw knowledge from seasoned experts. Professionals in the field say there are basic fundamentals that will help promote a better understanding of ASC coding. In addition, they can offer best practice advice for avoiding pitfalls to ensure optimal reimbursement. According to Ellis, Medicare provides a list of safe procedures that qualify for coverage if performed in an ASC. This list also becomes the basic list for many third-party payers. • The procedure generally results in extensive blood loss. • The procedure is of an emergent nature or life threatening. • The procedure commonly requires systemic thrombolytic therapy. • The procedure is not recognized for payment to hospitals under the outpatient prospective payment system. • The procedure can be reported using only an unlisted surgical procedure code. Ellis recommends that coders pay particular attention to the exclusion of unlisted surgical codes. “If a complicated procedure which must be billed with unlisted CPT codes is requested to be performed in the ASC facility on a Medicare patient, the ASC should decline the case and divert it to the hospital at the time of scheduling,” she says, noting that such a scenario will most likely lead the ASC to be declined payment. While these are basic rules of Medicare coverage, Ellis notes that they are not hard and fast. Coders can find some blood vessel procedures covered by Medicare, and third-party insurers often will have a broader definition of what’s covered. These points make it crucial that ASC coders are well versed in all the nuances. 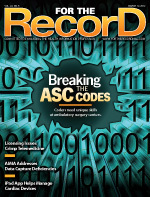 The Centers for Medicare & Medicaid Services (CMS) keeps ASC coders on their toes. “Each year, CMS puts out new lists,” Hyatt says. “Make sure you have the most current list for CMS outpatient surgery procedures.” It may seem obvious, but Hyatt says ASCs should have the most current Medicare CPT code book, cautioning that using the same edition for several years should not be viewed as a cost-saving measure. It’s sound advice, according to Ellis, who offers the following example as an indication of how small changes can have big impacts. In 2012, the American Medical Association revised the arthroscopic knee meniscectomy codes 29880 and 29881 to include a 29877 debridement/chondroplasty procedure in the same or other knee compartments. In 2011, the 29877 procedure was billed separately in such situations, but that is no longer the case. This situation may arise in the case of a knee scope procedure performed on the right knee in which a synovectomy (29875) is performed in the patella, a meniscectomy (29881) is performed in the medial compartment, and a chondroplasty (29877) is performed in the lateral compartment. If the claim for this surgery were being filed to Aetna, Ellis says the coding would be 29881-RT and 29875-59-RT. In this case, the -59 modifier, which is essentially an indicator that a procedure or service was distinct or separate from other services performed on the same day, should be used on the 29875 synovectomy procedure to avoid a payer denial. The 29875 code is designated as a separate procedure in the CPT book, and code 29875 is unbundled from code 29881 in the Medicare Correct Coding Initiative unbundling edits. In an ASC, patience is a virtue when it comes to coding. Hyatt points out that ASC environments don’t lend themselves to easy follow-up on procedural documentation because physicians tend to move in and out of the facilities rather quickly. Coders don’t have the luxury of walking down the hall to consult with a physician about a procedure or provide a reminder that an operative report is due. Because of this nuance, it is easy for coders to rush and try to code before the final documentation or operative report is complete. Hyatt cautions that this practice can create compliance issues and is likely to leave revenue on the table. Hyatt offers the example of a shoulder repair to demonstrate how failing to wait for the full report can impact reimbursement. In this case, the brief op report denotes that a patient is having a rotator cuff repair that will require an arthroscopic procedure. If the coder uses this information, the bill will include one code for that particular procedure. By looking at the full operative report, the coder may learn that a subacrominal decompression procedure and a debridement of another tendon was also required. During the procedure, the physician may have also decided the rotator cuff procedure needed to be open instead of arthroscopic. Under the one arthroscopic code, the ASC would have been reimbursed $4,171.42. “You would lose out on payment without waiting for the op report,” Hyatt notes. For example, in the case of implants, Medicare often includes the reimbursement of the implant in the procedural CPT code. That may not be the case with other payers. Consider a cataract repair that requires a false lens implant. The procedure and implant would fall under the CPT code 66984 for Medicare. Ellis points out that other payers may allow the implant to be billed separately. “Medicare does pay for some implants, but it varies greatly from state to state,” she says. Also, Medicare does not pay for a lot of X-rays because imaging is often included in the CPT code. Ellis notes that some payers allow for separate billing. To further muddy the waters, she notes there are exceptions when Medicare will allow imaging to be billed separately—for example, a retrograde pyelogram case in which an image of the urinary system is required. In this circumstance, however, Blue Cross Blue Shield and some other payers will not allow separate billing.